Thanks to an incredible scientific breakthrough, partially-paralyzed monkeys have gained the opportunity of learning how to walk again. 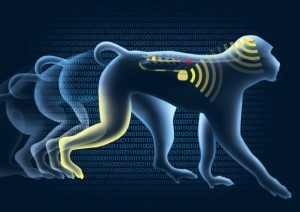 Scientists have used a wireless brain implant to sidestep the spinal cord injuries of two paralyzed rhesus macaques, allowing for their useless limbs to be reignited. The system involves wirelessly transmitting decoded brain signals in order to stimulate the muscles in charge of leg mobility. It marks the first time a neural prosthetic has regained movement in a primate. Though the brain-spinal interface has only been tested on macaques to date, the researchers believe this may open doors to discovering technology that could allow for the same to be done in humans paralyzed by spinal cord injuries. Astonishingly, one rhesus macaque fitted with the new implant was able to walk a mere six days after it was partially paralyzed from a surgical procedure that caused some of the nerves in its right hind leg to be severed. And another animal in the study, who had more serious nerve damage in its right hind leg, recovered its ability to walk two weeks with the help of the device. Both monkeys had full mobility in three months. This is the latest breakthrough for the “brain-spine interface” within neuroprosthetics, and has given scientists hope for reading intentions in the brain’s activity and using it to control computer, robotic arms, and paralyzed limbs. The researchers, from Switzerland and Germany, wanted to restore the lost movement that happens from injuries in the upper spine that cause a disconnect in the communication channel of the brain’s motor cortex and lumbar region in the lower spinal cord that allow us to walk. Their vision was to do this wirelessly, therefore completely bypassing the severed nerves. The system, stemming from technology called BrainGate, involves a pill-sized electrode array that is implanted in the brain. There, it gathers movement signals created by the motor cortex. The wireless sensor would then work to provide the signals to a computer, where they are decoded, and eventually sent back wirelessly via an electrical stimulator that is implanted in the lumbar spine just south of the spinal injury. When this stimulation signals spinal nerves, the leg muscles are then activated. The researchers call the ability to restore movement without wires a pivotal breakthrough, because wired brain-sensing systems can hinder the ability to move freely. There is, undoubtedly, still many limitations of the system, though it is clearly an impressive accomplishment. The interface, for instance, is still in need of a separate computer that is able to decode the signals, specifically the wireless signals that, in their current state, can only get sent one way, which is from the brain to the legs. “In a full translational study, we would want to do more quantification about how balanced the animal is during walking and measure the forces they’re able to apply,” notes Borton. Andrew Jackson at Newcastle University’s Institute of Neuroscience celebrated the breakthrough as a “major step” toward recovering lost movement with neural implants. “When you think about bipedal walking, balance and steering are a challenge, but optimistically this could be used to allow people to walk with some kind of support, such as a frame,” he explained.